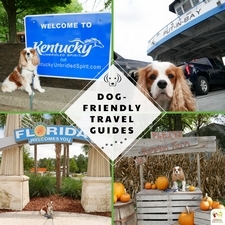 4 Fun Things To Do with Your Dog Outside. As some of you probably already know, I am a big advocate for keeping your dog on a leash when out in public, or even in your own yard unless it is securely fenced. Some people may think I’m a bit nuts, or too cautious, but I feel I am only being safe, and most importantly, ensuring the safety of my own dog. I do not appreciate or tolerate unleashed dogs coming up to my dog or me when not invited. I even wrote a blog post on how to keep your dog safe in this situation. You can read that article here. Just because my dog Dexter is friendly, social, appropriate, and under verbal control does not give me the right to break the leash law. It’s that simple. Okay, time to get off this rant. This post was prompted by some Facebook friends who asked me what kinds of things they could do with their dogs outside if they do not have a fenced-in yard for exercise and are avoiding dog parks and doggie day cares. 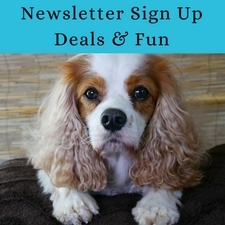 These ideas may not be suitable for all dogs depending on their health and behavior. 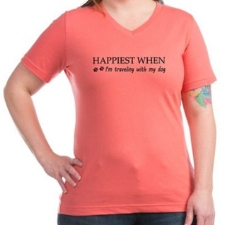 So choose which options work for you and your dog and edit as needed. 1. Take your dog to the park as often as you can. Taking your dog to various parks on his dog harness and 6′ dog leash is great exercise both physically and mentally. Don’t forget to bring the high-value organic dog treats for keeping his attention on you and for dog training along the way. I love to mix it up by visiting different parks and taking different trails. The goal is to not be boring and predictable. 2. 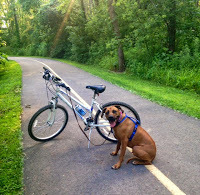 Take your dog for a bike ride! There are a few options in this selection. 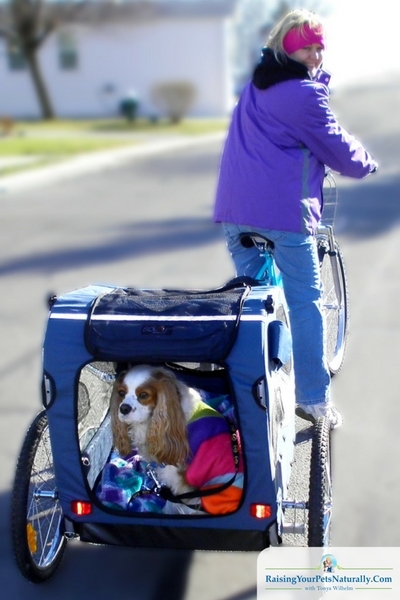 The first is to use a dog bike attachment made exclusively for dogs. It hooks to the core of your bike and has a metal arm that goes out with a dog leash that you attach to your dog’s BACK clipping dog harness. Of course, you will need to slowly build your dog’s confidence and conditioning before going out for a full run. Learn how in this post. Hugo is just starting to bike with his Mom. The second way to bike with your dog, and what I do with Dexter, is to use a dog bicycle trailer that hooks to your bike. 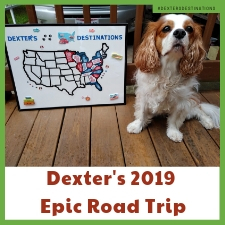 Dexter really loves this adventure, and we can go for longer rides since he won’t get too tired. 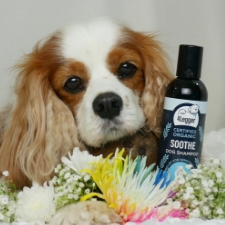 Perfect for senior dogs, puppies, or dogs with medical conditions. Read my review of the Track’r Houndabout Dog Bike Trailer. 3. 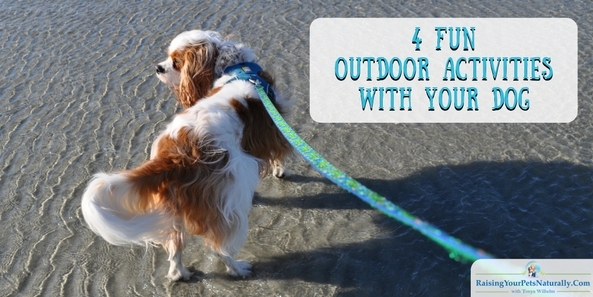 Outdoor games with your dog on a long leash. When I say a long leash, I mean you can purchase a dog leash that is 10-100′ in length. 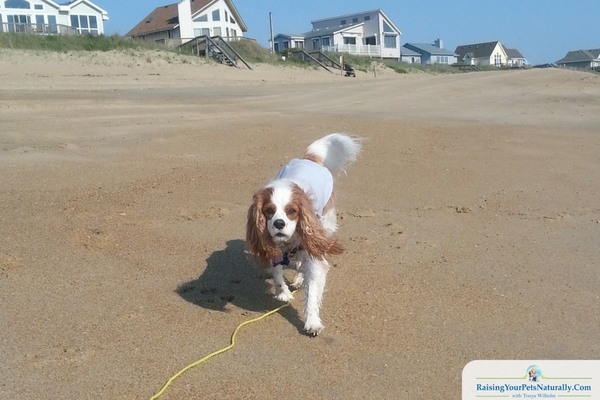 By attaching this long dog leash to your dog’s harness, you can ensure safety when playing in your unfenced yard, on the beach, field, or open area in a park. With this type of leash attached, Dexter has the freedom to move around, fetch, run and sniff and I have the security of him being on a leash. We can pretty much do anything this way! I tend to use a lead that’s 20′ or 30′ long or more, depending on what I’m doing. 4. Swimming is a great exercise for dogs and a nice way to cool down. Again, you have a few options. First, you can get a child’s swimming pool and allow your dog to wade in it, or for the smaller dogs, they can even swim! They now have portable dog pools that can fold up for the winter! The second way would be in a regular size pool, lake, or pond. But just keep in mind that a lot of dogs need help in learning how to swim, even our retrievers and water dogs! You can purchase a dog life jacket to help your dog learn and to give you a little security as well. Dexter always wears his when we are boating. ***Keep in mind, if you are still not in a fenced-in area, you will want to keep your dog leashed. I made Dexter his own long leash out of boat line and a lobster claw clip. 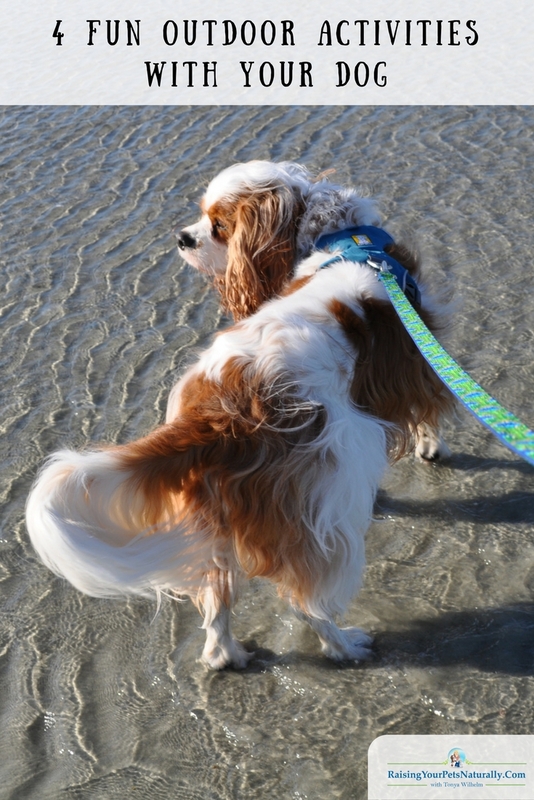 Unlike the 30′ cotton dog leash, which absorbs water and sinks, the boat line floats! I hope you find some of these ideas helpful. Just keep in mind, the games you can play with your dog outside or inside are endless! I will work at teaching you some games in future blog posts. There are just so many to choose from! Always keep the weather in mind. Dogs can get overheated or too cold very quickly. Have lots of fresh water for both you and your dog. I prefer to use a stainless steel water bottle for Dexter. I am a fan of dog cooling jackets too! I made Dexter’s, but there are some nice ones available on the market. Build your dog’s tolerance for exercise slowly. Just like we need to start an exercise program slowly, so does your dog. Dogs under 2 years of age are still developing and growing their bones and muscles. Talk with your holistic veterinarian prior to starting an exercise program. Bring healthy dog treats for attention. Have a dog first aid kit in your car or in your backpack. What are your favorite outdoor games with your dog? Tell me in the comments.